The simple things, the simple things, simplicity. I have known what Side View’s theme is since Friday, and my mind has been flitting across the spectrum of simplicity, from my Quakers’ Meeting House which I visited during the week, to naive art like LS Lowrie’s, to the plainchant I used to labour over translating from its mediaeval notation into conventional Western notation. And as I pottered round the house, picking each idea up like a cat with a toy and flipping it about and then skipping frivolously onto the next, I came upon Felix’s latest bath project. Baths are serious businesses here in Shrewsday Mansions. Play there is some of the most relaxed and unhurried we get. If we listened to toymakers and their vast marketing departments, we could have a plethora of colour-shifting, shape-changing, water-shooting toys. The world of the bath toy has moved on so very far since the advent of the rubber duck. But my son has beloved toys, and his mind, borne of generations of engineers, is perfectly up to divining which of his toys can tolerate daily dousings. He has commandeered his beloved Playmobil Viking ship – a truly splendid toy – and he has recruited a cosmopolitan crew from his collection of Lego figures. Thus a Star Wars Storm Trooper is on the same team as Thrandruil, Tolkein’s Elven king, and Bilbo Baggins, a non-specific security guard; and Robin. I don’t know where Batman is. There are many who argue children should play with their toys the way the manufacturers intended. But the simplicity of an unspoilt child’s vision, for me, using what there is, and mixing and matching to create a new game: it is beyond price. I shall leave you with the creation of my daughter: whose friends experiment with make up and spend their leisure days at the shops. She is still besotted with owls. Posted in Shrewsday MansionsTagged Lego, Playmobil, Side View's Theme, simplicity, toys, View From The SideBookmark the permalink. A loaded word, Sidey 😀 Life is never dull. Ha! What do toymakers know about the actual playing? 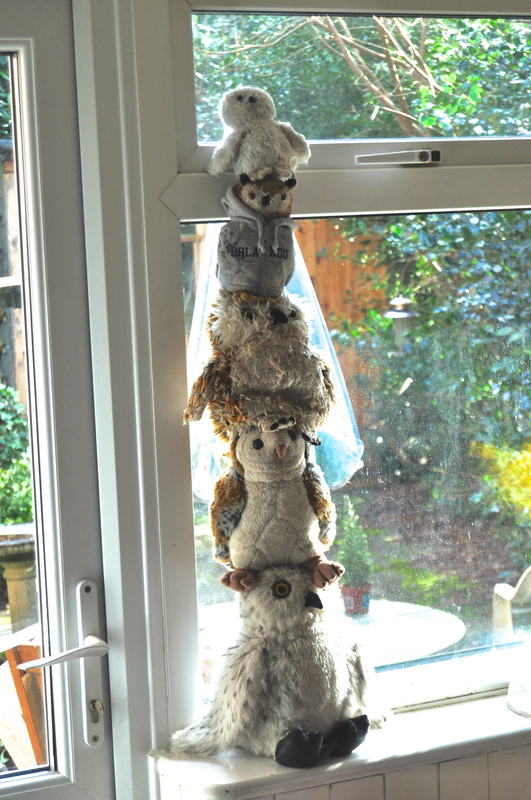 The tu-whootum pole rises to being quite a owling success! Imagine! It’s as if even the toymakers are in on what some see as a plot to ‘numb and dumb’ the populations of the world, starting at the youngest age. “But the simplicity of an unspoilt child’s vision, for me, using what there is, and mixing and matching to create a new game: it is beyond price.” – Amen! I love the viking ship and the tower of owls, Kate! The simple things are more fun! Love it! Love it all; the Viking ship with its Lego crew and Felix’s sense of adventure and Maddie’s owl totem. We gave our little grands a Playskool Nativity. Ezra is too young, but, Kezzie knows she has to share it, so, Baby Jesus usually spends time napping with little brother, while her own Thomas tanks visit with the Holy Family. Oh, Penny, how wonderful: reminds me of my own. Children are eclectic: they mix and match. Tell Thomas to say hello to Mary and Joseph for me. I just love this picture Kate “And as I pottered round the house, picking each idea up like a cat with a toy and flipping it about and then skipping frivolously onto the next,”! I think you may have captured the way women think in one simple phrase. 🙂 As for letting children play as their imagination leads them … how will we discover new and wonderful things about our world if not but through the eyes of a child? You are so right, Hope. The way children see things; it keeps us all balanced, I think. Absolutely delightful. I know I’d love your children. Children see the world the best way. It is hard to remember to do that myself, but the simplicity is worth it. Great post. I love the owls, too. Love their creative imaginations. It makes me wonder just how those toys got along. I’m glad Maddie’s vision is more focused on her stuffed owls than makeup. Most children do grow up too fast. Cheers to the Shrewsday children for enjoying being who they are. Thanks, Judy. I know new times will be along soon, but I’ll enjoy these while they’re still here..
Love the owls. I was given some small, fancy dolls with international costumes when I was pretty small. They had been meant for display and not to be manhandled by children, although they were given to me as presents. I took them into the bath with me and thoroughly washed and shampooed them while they were fully clothed. They didn’t last long and I believe I was scolded for not behaving properly. Oh, what a shame: why make toys if not to be played with? Hohum. I had a couple of china dolls, tiny ones dressed in the clothes of the French court around the time of the Sun King. I played with them endlessly, can you imagine having a toy like that? But though decorative, they were sturdy. I was lucky. I completely agree with you about “the simplicity of an unspoilt child’s vision, for me, using what there is, and mixing and matching to create a new game: it is beyond price.” When I was a kid I had an Illya Kuryakin “Man from UNCLE” doll that I transformed into Omar Sharif as Dr. Zhivago (painted the hair black and added a mustache) since I liked that film so much. Of course, had I left that doll alone and still had it today, it would probably be worth a mint … The stack of owls and the viking ship both look well cared for. I love your Omar Sharif creation. I, too, thought he was epic. I suppose they never thought to make an Omar doll. Whadda guy. He was great in “Funny Girl”, too, but it was seeing him in “Lawrence of Arabia” that got me on the Omar bandwagon early on. Let everyone else have Peter O’Toole. Better cool it with the gushing, I don’t want anyone to get the false impression that I’m straight. Your post made me think of several things. First, I am overdue for an Ankerstein post and also my Dad had surgery for Viking Hand last week so I am thinking of my Irish/Scottish heritage and the influence that the Vikings had on them. I had never heard of Viking hand: so I looked it up! I had only ever know this condition as Dupuytren’s contracture – so I’ve learned something new today! I cant imagine who those people are who would advocate that children should play with toys as they were designed to be played with. Both the ship and the totem pole are delightful. What a lovely post! Long live their freedom of imagination. Toys, like writing prompts, should be viewed as tools to allow the imagination to wander where it will. Perfect. The Bonny Beard and her ragtag crew of vintage Storm Troopers and colonial militia would sail alongside your Felix’s Viking ship any day.